On June 12, we arrived in Turkey. I had never been to Turkey, or Asia, or a predominantly Muslim country before, so I was excited to get off the ship and explore. The ship docked in the modern town of Kusadasi, which is just a few miles south of the ancient town of Ephesus. 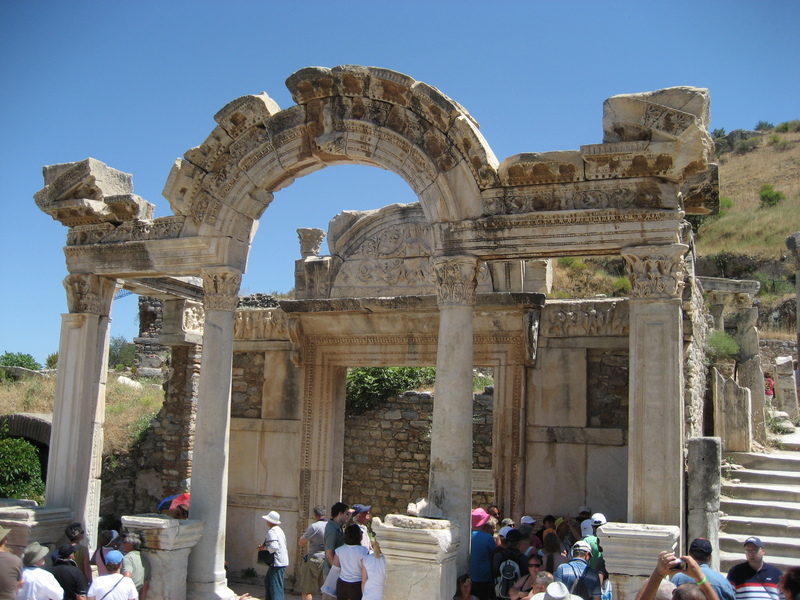 We were all very excited to see Ephesus, so we signed up for a shore excursion that took us to the ruins of St. John’s Basilica, the shrine of the Virgin Mary, ancient Ephesus, and ended back in Kusadasi with a carpet weaving demonstration. Our tour guide was a Turk named Ozzie. I looked at his tour guide name tag around his neck at one point during the tour, and saw that his full name was Mehmet Ozguir. I suppose if I lived in Turkey and my name was Mehmet, I would probably go by a nickname as well, since it’s such a popular name and I wouldn’t want to be confused with all the other Mehmets out there. The first stop, as I mentioned, was the ruins of St. John’s Basilica. 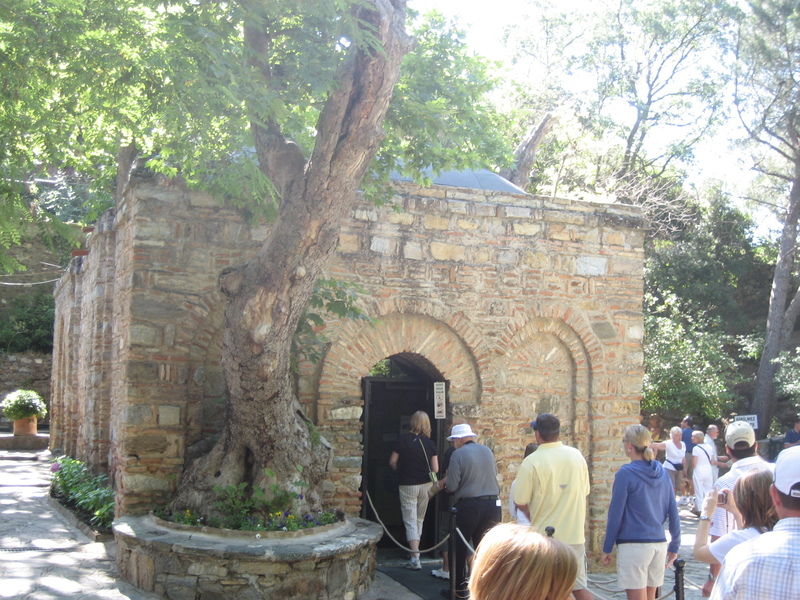 According to tradition, John the apostle lived in Ephesus in his later years, and this church was built over his tomb during the reign of Justinian I in the sixth century. It is very close to the Temple of Artemis, which was one of the seven wonders of the ancient world—the second one we visited on this trip, after the statue of Zeus at Olympia, which no longer exists. 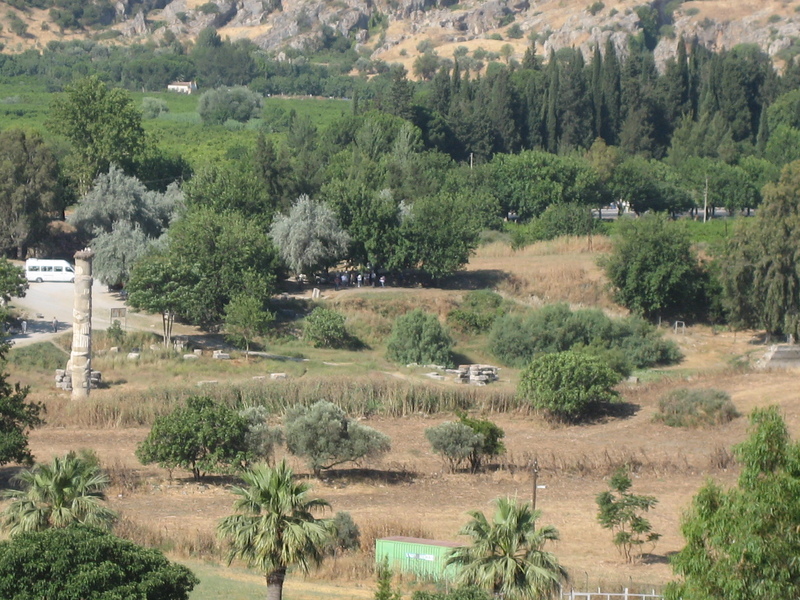 As you can see from this photo, the Temple of Artemis isn’t doing so well either. 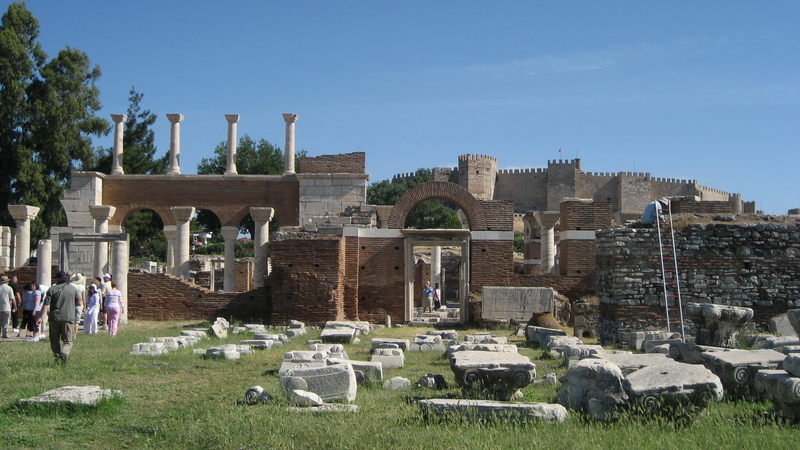 Its destruction was ordered in 405 by John Chrysostom while he was bishop of Constantinople, and some of the building materials were reused in other projects. 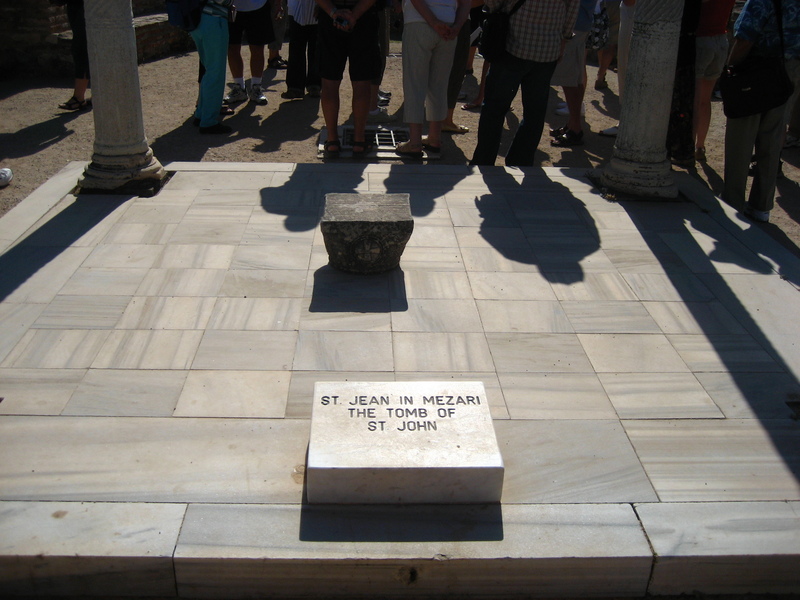 While inside the basilica, we saw the tomb of St. John and a wonderful cross-shaped baptismal. 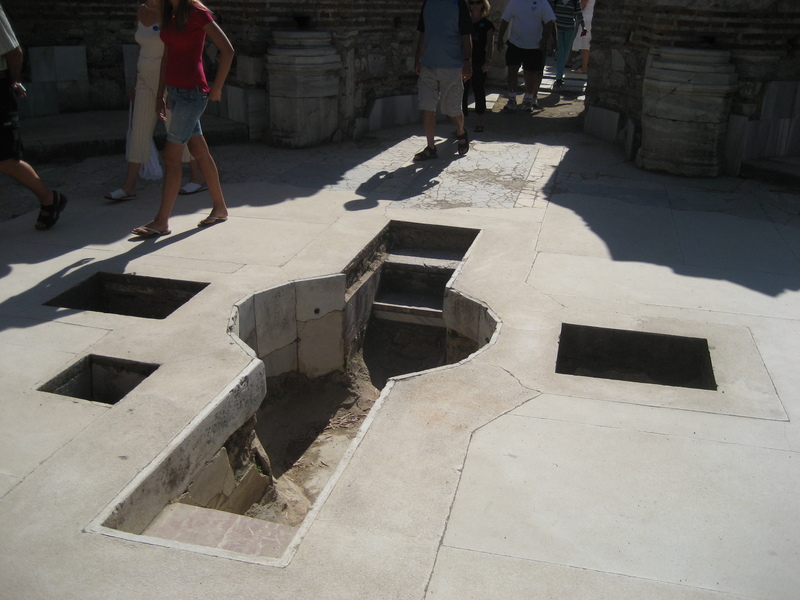 Those who were being baptized walked down the steps at one end and up the steps at the other. 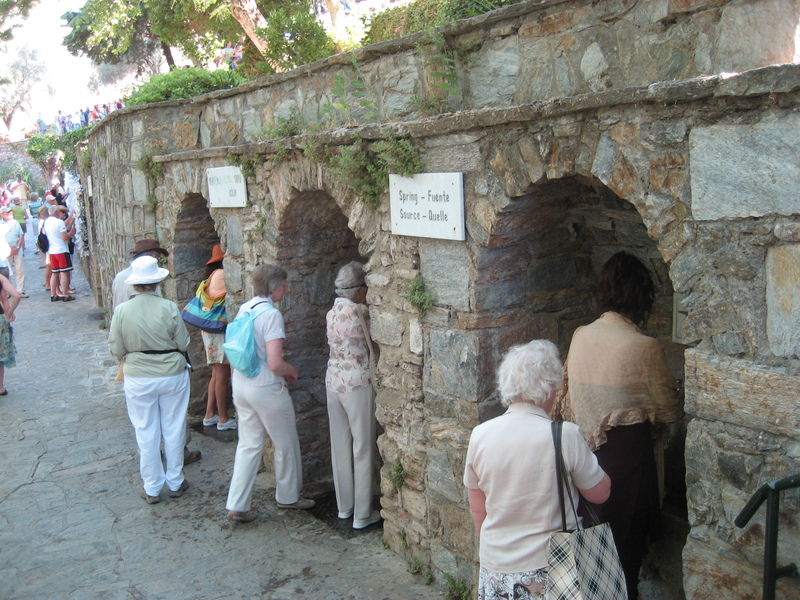 After the basilica of St. John, we went to the House of the Virgin Mary, which is up a winding road on a mountain above Ephesus. According to some traditions, this is the house that Mary lived in before she died, or was assumed, or whatever happened to her (different traditions disagree). Just like Zechariah (whose tomb in Venice I wrote about here), I’m not sure whether I believe Mary actually lived in this house, especially since the tradition only dates to the 19th century and relies on a vision of a nun. 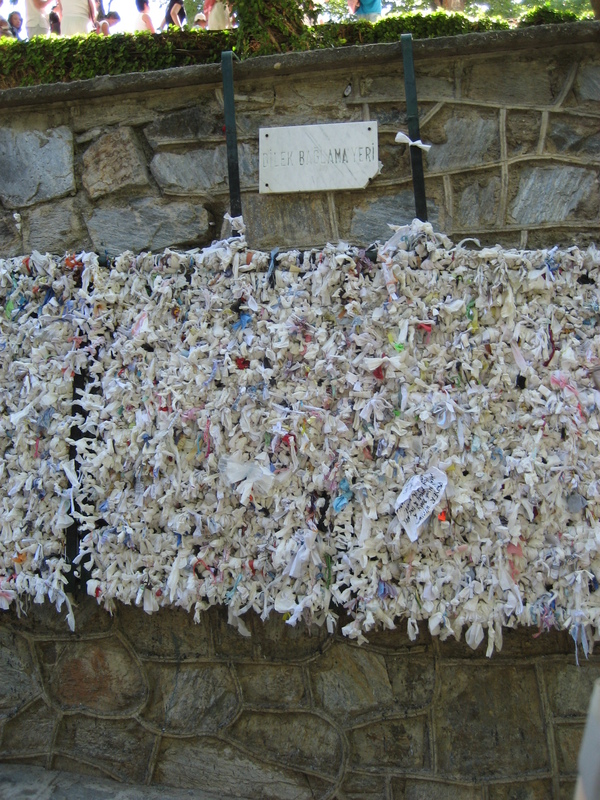 It has been visited by several popes, though, and there were lots of pilgrims there. I bought a magnet and a patch from a shop there (because of course they sell magnets and patches at the House of the Virgin Mary). 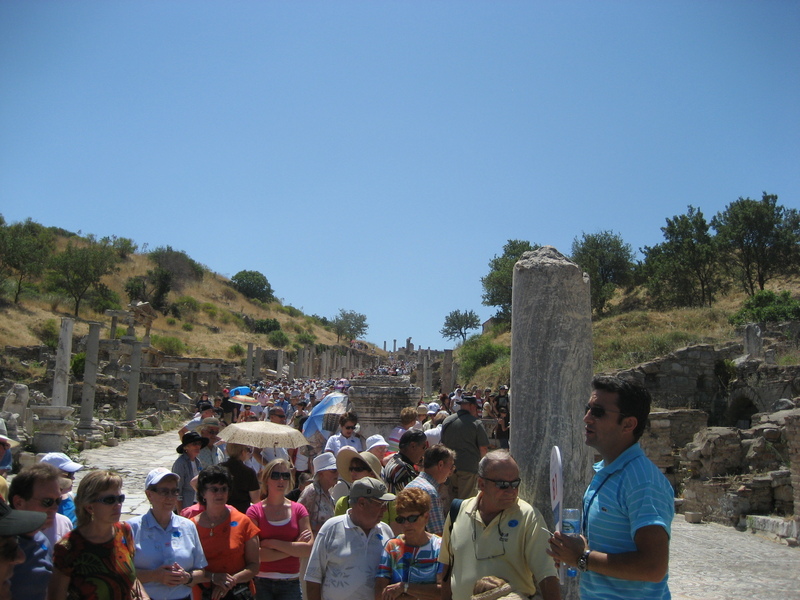 Our next stop was ancient Ephesus. Ozzie took us in the upper entrance, and we walked downhill through the site and exited close to where the harbor once was. The site is now several kilometers away from the ocean, though, because the harbor continually silted up until the city was abandoned. 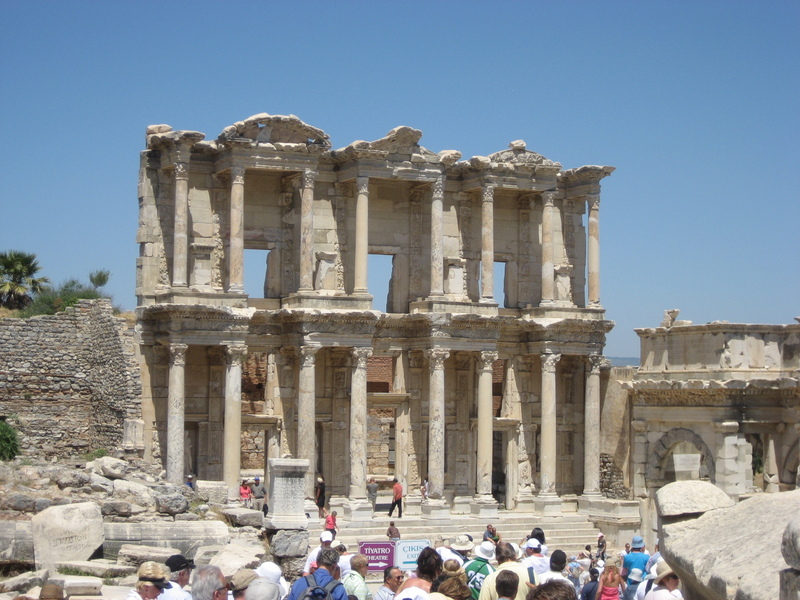 Part of the reason for this, according to Ozzie, was that the residents of Ephesus cut down many of the trees on the surrounding mountains to burn for fuel. Without the tree roots to prevent mudslides when it rained, a lot of the soil slid straight down into the harbor, eventually filling it in. The last thing we saw before exiting was the huge ampitheater. 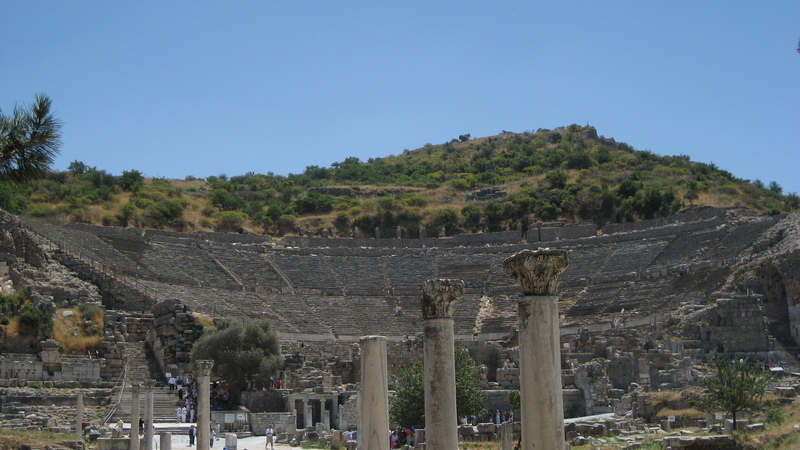 I was particularly interested in seeing this because it is the ampitheater mentioned in Acts 19:29, when Paul is in Ephesus and creates an uproar among the worshipers of Artemis. 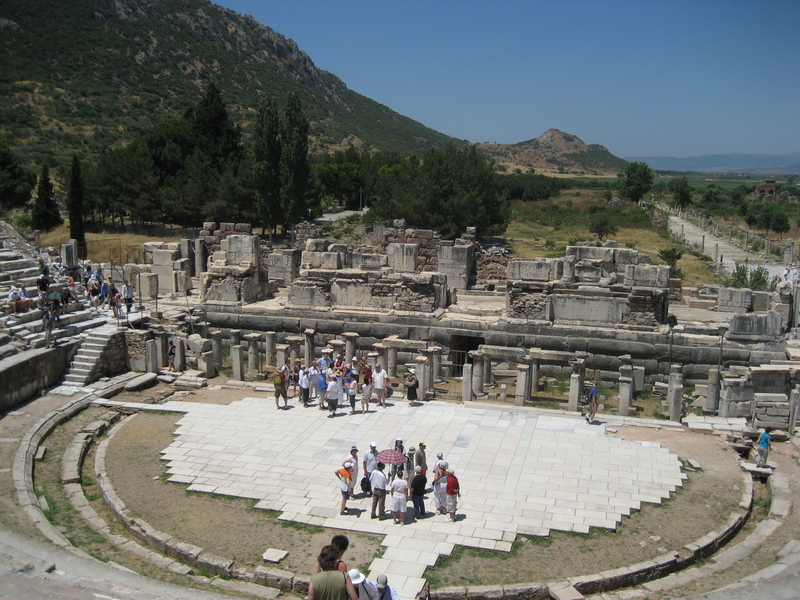 They gathered in this ampitheater and shouted “Great is Artemis of the Ephesians” for hours. After we exited, there was of course a place to buy souvenirs (where I took a picture of a sign advertising “Genuine Fake Watches”), and I bought a little statue of Artemis—just to know what she looked like in order to have a more informed understanding of the ancient world (and the book of Acts). The guy I bought the statue from was chatting me up after I bought it, hoping that I would buy more stuff. At one point, he lowered his voice to a conspiratorial whisper and said to me, “I don’t know but maybe I thought I would ask; perhaps you are interested in old coins? Not imitations, real ones. Alexander…” I told him no, I wasn’t a coin collector and I wasn’t interested. Soon after, I was back on the bus telling Mary about how funny I thought it was that he should speak in hushed tones when he was trying to sell me something. She mentioned something I hadn’t thought of—namely, he was probably selling these coins illegally. It made me glad I hadn’t bought one, since that kind of stuff can easily be confiscated when you’re crossing borders. The seller gets the money, but you don’t keep the coin. After the carpet demonstration, we walked into the market at Kusadasi to look around. As a Westerner, it was a little intimidating with the salesmen calling out to passersby and asking them to take a look at their wares. It is definitely foreign to me. I was kind of interested in getting a carpet, but wasn’t prepared for how expensive they were. I guess there’s a reason why Turkish carpets are famous around the world, and it’s not because they’re cheap. We did end up going into another carpet shop and taking a look at what they had available. We sipped some apple tea and listened to our salesman, Levant (who had a fantastic American English accent), give us the pitch. Mary and I thought it was funny how he would say “Take care” whenever he wanted to alert our attention to something. After a while, my dad actually did buy a 3 x 5 foot carpet for almost $700. We spent quite a while in the carpet shop, and found out where Levant got his accent: in the apartment building where he grew up, there were also a lot of NATO employees and their families, mostly from the United States. So he he got his accent in his apartment building, growing up with American friends. 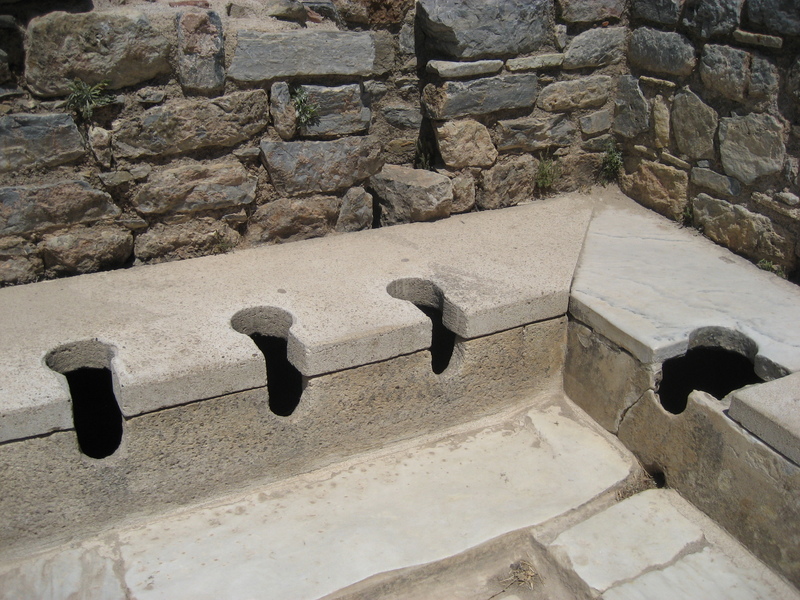 Hey your photos of Ephesus are really good. I have been to Kusadasi before and agree the salesman can be pretty full on. All good fun though.